When approaching a project which is made out of wood, there are many decisions which need to be made which will affect how the finished product will look. Not only do you need to have a good design in mind, and have the right tools to accomplish your design, but you also have to decide if you are going to use a stain, and if so, what color. After all of these decisions have been made, you have one more which needs to be resolved, which includes to you put on a top coat of protection? If you do decide to add on a top coat of added protection, there are three main types of coatings you can choose from, which include Tung Oil, Linseed Oil and Danish Oil. Each type of oil is made from a different kind of material, and has its special function available to you. Within this article, we’ll discuss the makeup of each of these three oils, and what the benefits and drawbacks are of each. Tung Oil is known as a drying oil, and is derived from the seed from a Tung tree. The Tung tree has seeds, which when the seeds are compressed, releases an oil which can be used for a variety of different functions. When the oil from the seed is exposed to natural environments, it will harden immediately. When this occurs, it creates a very clear and transparent coating on the material, which is a great coating for your projects, especially when it comes to wood. Although it is transparent, it will typically tint your finished project to a little bit of a golden color. Because of how quickly it tends to dry, you will need to mix this product with a diluting agent in order for it to seep into the wood and seal the project from within as much as possible. By allowing it to penetrate into the wood, you can create a long lasting and durable protection solution for your project. In addition to all of this, Tung Oil will not discolor over time. However, Tung Oil is not a scratch resistant substance, and if your project is scratched, more than likely that area will be exposed as Tung oil only adheres to the material it is applied to. Tung oil is known as a very environmentally friendly material. However, because of the way it is produced, finding a bottle of 100% Tung oil can be more difficult, and more expensive. More times than not, any bottle of Tung Oil you will see on the shelf is actually comprised of a variety of different materials, most notably mineral spirits. By doing this, the bottle of oil is less expensive and is easier to apply; however, the higher the percentage of mineral spirits, the more toxic fumes will be within the bottle. Before you purchase any bottle which says it has Tung Oil in it, you need to verify the percentage of Tung Oil within that bottle. Another oil which is known as a drying oil, the Linseed oil is an oil which is comprised of seeds which come from the Flax plant. The seeds are typically ripe and dry, and will provide a finish which tends to fall between clear and a yellow hue. The oil is compressed out of the seed, and then extracted out so it can change into a polymer. This process allows the oil which is extracted out to be used by itself, or can be blended in with a large variety of other oils, solvents or resins. Besides being used as a top coat on wood projects, the Linseed oil has many other features which are used across a wide spectrum of products. Most commonly today, Linseed oil can be found in nutritional vitamins, as it is known for having the highest amount of omega-3 component among all vegetable oils. In addition to the vitamins, it is also used in linoleum, gilding and putty. Lastly, you will see Linseed oil used as a Paint Binder, especially for oil paints. This is because Linseed will allow the oil paint to be applied easier and more effectively, and is available in a large assortment of options. Linseed oil, when used as a clear coat on a wooden project, has started to decline in use over the last 30 years. The reason for this is because the longer Linseed oil is out and exposed to sunlight and other climate elements, the more it will become brittle and turn yellow. Although the initial finished product does look nice, your project will end up having a yellow hue on it just a few years after it has been applied. Some consumers are alright with this, as it does give the pieces a weathered look. However, more people want their projects to look the same five years from now as it does today – if that is the case for you, then you will need to find a different product than Linseed oil. Danish Oil is a unique product, as it is made from the best combination of Tung Oil and Linseed Oil. It is also known as a drying oil, which will harden very quickly once applied to the project. In addition to this, the coating is unaffected by water, and the finish along the project is usually of a satin grade. Not only can it serve as a top coat, but you can also use this oil as a way to prime wood before it is painted or stained. It will provide a clean and clear finish for you to apply whatever you want the finishing coat to be on your project. Compared to Tung Oil, which dries almost immediately and Linseed Oil, which can take 24-48 hours per coat to dry, Danish oil can dry anywhere between 4-8 hours. The drying factor is determined by the environment in which it is drying within. The more moisture which is in the air, the longer it will take to dry. In contrast, the drier the air, or the more wind you apply to the project thru the use of a fan, the faster it will dry. You will typically need to apply 2-3 coats of the Danish oil to ensure it holds properly over time. The most common projects for Danish oil include a lot of inside projects, including tables, as well as wooden spoons and utensils. Although it can resist water, it will break down over time if left outside on a constant basis. Also, with Danish oil, because of the way it comprised, there is some risk concerning its ability to spontaneous combust, especially due to the fumes. This is why, when you finish up with the project, you need to immediately soak the brush or rags in water, and they need to be completely dried before being thrown in the trash. There is no good solution to using a brush or a rag again after using it in Danish Oil, so make sure you are using a product you are alright with disposing of after you have used it to apply your Danish Oil to a project. This bottle of Tung Oil is made from 100% Tung Oil, with no extra additives or ingredients. This can serve as both a stain and a finish, allowing you to have multiple features within one bottle. It will provide a finish which will be low in gloss, and is manufactured from the Hope company. Manufactured within the United States, this Linseed Oil from Sunnyside Corporation is made from a flax plant, and the seeds which it produces. Will provide a very durable and uniform finish, which will be glossier compared to other options within the marketplace. Once applied to your projects, will dry within 12 to 18 hours. 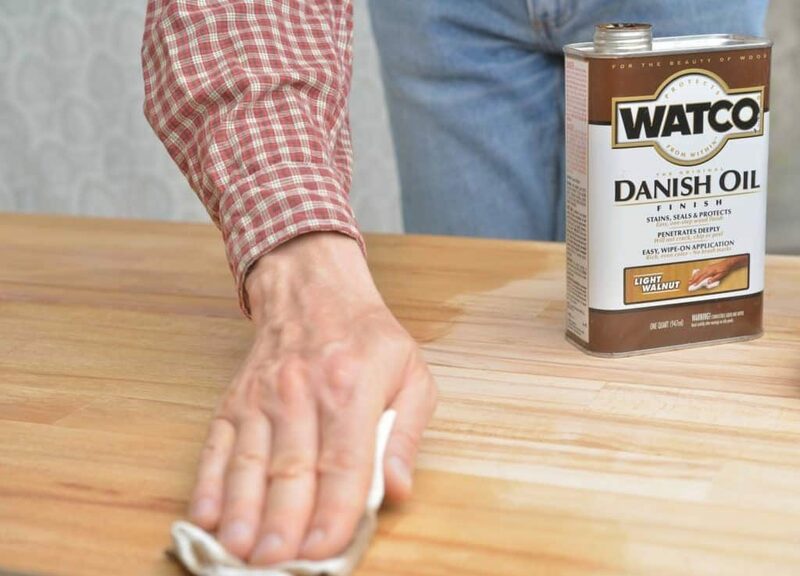 Sold as a one-pint solution, this Danish Oil from Watco comes in several color to choose from, so you can find the right finishing color for your needs. This is an oil-based product, and is derived from a combination of Tung and Linseed. Should be utilized on bare, sanded or stripped wood applications. There are many benefits to each type of oil when used as a drying oil, especially when you compare their long lasting benefits they each have. Will it Discolor over Time? Will the Clear Coat stay? Overall, the best product for a wood finishing project is Tung Oil. Although it will be a little bit more expensive, the product will look nice when complete, and there is very little chance of it combusting on you during use. Very good comparison overview of the 3 finishes. Is there any benefit or contra-indication of applying buffing paste wax to these finishes? Ummm, Tung oil is the slowest drying oil by far…..your article is completely misleading.